The Bantronic Ultra has arrived. Equipped with piezo, single-coil, and double-coil pick-ups, a frequensator tailpiece, and a built-in body-timbre-mechanism: this electric banjo is unlike anything you’ve seen or heard before. Play effortlessly up and down the ergonomically-correct neck. The banjo’s cumbersome fifth peg has finally been moved to the headstock, resulting in a more intuitive and comfortable playing experience. Tuning is also easier than ever before with the Ultra’s smooth, fine-precision tuning machines. Mode 1: The body is open and responds like a traditional banjo. The plucked string vibrates on a movable bridge that rests on the drumhead. Play unplugged as you normally would, or plug in to your amp for more sound. You can now choose between the three pickups. Utilize the piezo pickup to maintain the traditional banjo sound through the amp. Mode 2: The body is solid. A block comes to rest beneath the bridge. When the string is plucked, it’s energy is transmitted past the drumhead and directly into the solid surrounding body. In this mode, the instrument will play quietly unplugged—great for practicing at home. When plugged in, the tone changes drastically from a traditional banjo. The sustain and emotion increases allowing to play very much like you would expect to play an electric guitar. 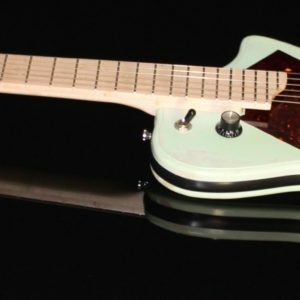 The ability to effortlessly switch between acoustic and electric, open and solid body modes is what makes this model…well, it makes it “ULTRA”. Add this new tool to your musician’s workbench to build incredible and genre-defying new music. This instrument is available with five or six string necks. Many other custom options are available upon request.